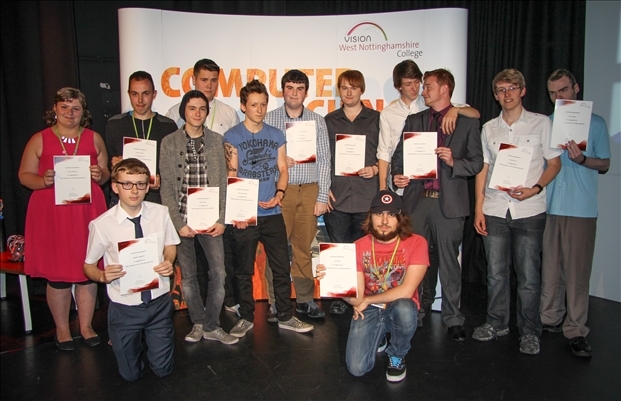 Students on computer science courses at West Nottinghamshire College were praised for their hard work and contribution over the last year at a celebration evening this week (16 June). Certificates of achievement were presented to 34 learners on courses ranging from BTEC First Diploma in IT and Creative Technology through to university-level HNDs in Computing and Systems Development. Special awards were presented in categories including the college values award, Robot Wars trophy, individual contribution and general progress and achievement. Parents and friends joined students and tutors for the awards presentation and had the opportunity to view a showcase of students’ work in the Create building at the Derby Road campus. Head of school for creative industries and digital technologies Steve McAlone said: “It was a pleasure to reward our hard-working students and celebrate their creativity and innovation in this area of study.